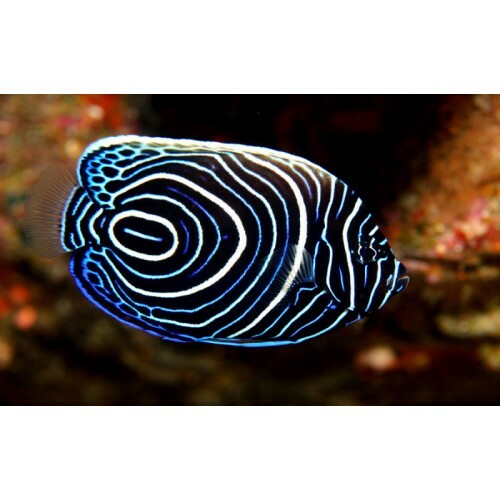 The adult Emperor Angelfish, also called the Imperator Angelfish, has a bold, blue body covered with bright yellow horizontal stripes culminating in a bright yellow to orange caudal fin. A striking blue-black mask covers the eyes and a similarly-coloured vertical band extends from the pectoral fin two-thirds of the way up the body. This band is highlighted in a sapphire-blue in front, and bright yellow, caudally. The mouth is white. The juvenile is black with circular white and blue stripes starting at the tail. Although sought after for its colours, in captivity, the adult coloration may not be as striking or brilliant. 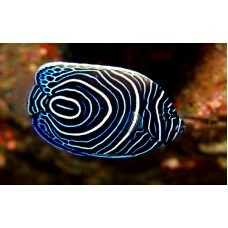 The changing angelfish will vary in coloration and pattern as it transforms from juvenile to the adult coloration. The recommended water temperature is 72-78º F / 24-28º C. Keep the specific gravity between 1.020 and 1.025 and the pH-value within the 8.1-8.4 range.